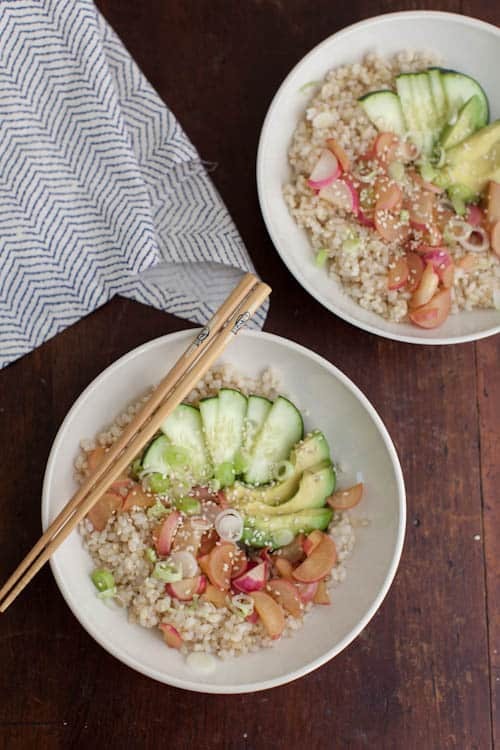 Deconstructed Radish Sushi Bowl | Naturally. If you were to ever meet my husband and I in person, there are approximately three areas of interest that we love to talk about: food, technology, and music (which might seem obvious given this food site, my husband is a software engineer while I co-run a design company, and my background is in music education while the company my husband works for does VIP events and websites for musical artist.) So you can imagine my excitment when a couple years ago (I think, time runs together and things get foggy), I stumbled upon Turntable Kitchen which had two of our favorites: Food and Music. Today’s recipe comes straight from Turntable Kitchen. A couple months back, I made the trek down to San Francisco to meet up with Kasey (and Neko!) for the morning and she filled me in on a few awesome ideas they were working on for their site. They’ve been running the Pairings Boxes for a while (I’ve subscribed before and it’s one of the best mail days when the box arrives) which has led to quite the archive of wonderful recipes. I’m in love with this deconstructed sushi bowl from their recipe collection. While the original recipe calls for shrimp, I had a bit of fun with spring produce and used radishes (although, tofu would work too!) Instead of sushi rice, I used sweet brown rice. The brown rice is similar to sushi rice in that it has a bit of sticky quality (I’ve even used it to make actual sushi before.) 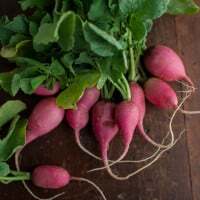 I’m also not picky about radish variety- so play around! Before starting, rinse the rice until the water runs mostly clear. Combine the rice with the 2 cups of water. Bring rice to a boil, reduce to a simmer, cover, and let cook for 45 minutes. Remove pot from heat and let sit for another 10 minutes. In a small bowl, whisk together the honey, vinegar, and salt. Pour over the still-warm rice and stir until rice is coated. Cover and set aside until ready to use. 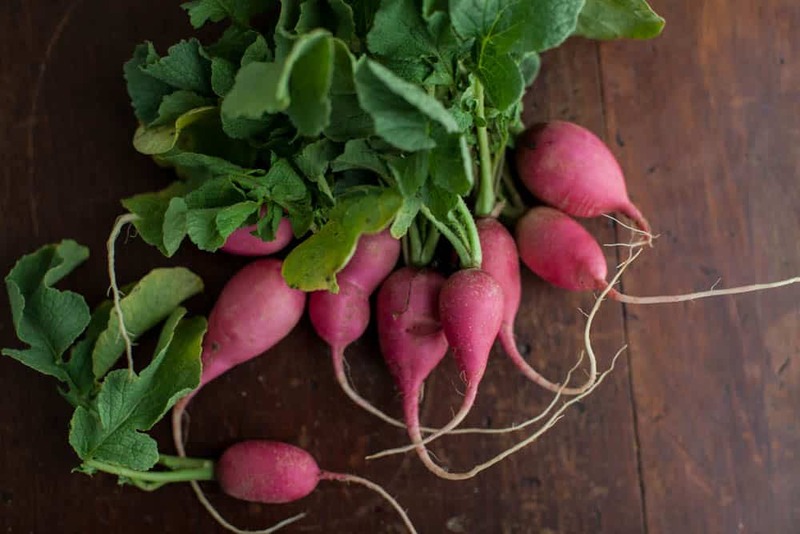 Rinse and cut the radishes in half lengthwise then cutting each half into ¼” thick slices. Heat the sake, soy sauce, and mirin in a large skillet. 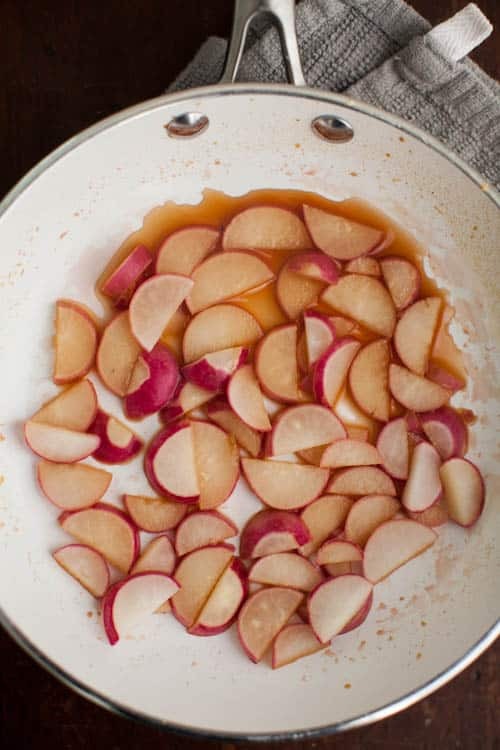 Once warm, add the sliced radishes and cook, stirring occasionally until radishes are tender but still have a bit of crispness left. Assemble the sushi bowls by dividing the rice in half and topping each bowl with radishes and an assortment of toppings (I used everything!) Serve with extra soy sauce. *Matt and Kasey’s recipe calls from sushi rice but I chose to use sweet brown rice (which still has similar qualities to sushi rice). However, if you want to use sushi rice, use 2 cups sushi rice with 2 cups water and cook, covered, for 15 minutes over low heat then remove from the heat and let sit for another 10 minutes. I love sushi bowls, such a nice little change from eating regular sushi. 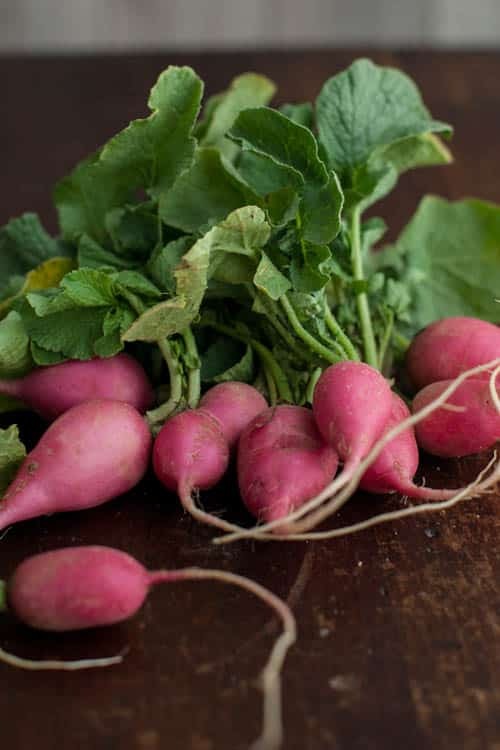 I love your inclusion of radishes here – I’ve actually only ever eaten them raw so would be interested to see what they taste like cooked. 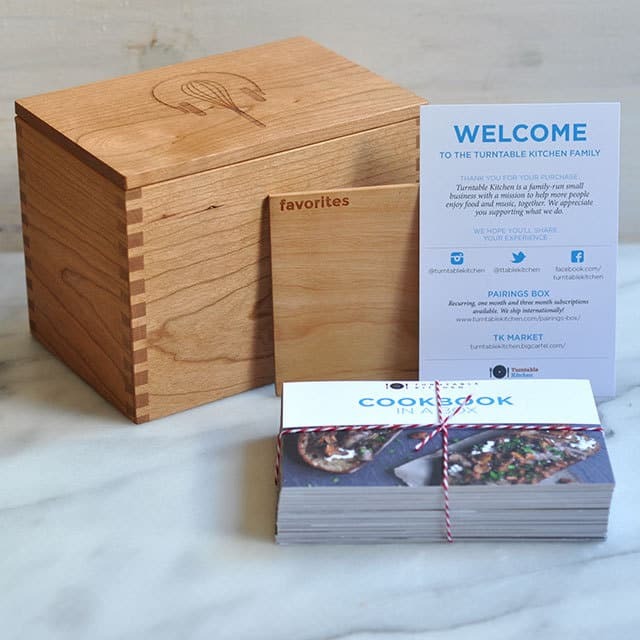 And I LOVE the look of the TK cookbook in a box – great idea! Absolutely adore deconstructed bowls of any kind, but this one looks super flavorful and yummy. I like that you cook the radishes instead. I usually also eat them raw, so I like this change up. This made a great workday lunch. Question about the rice: mine was horribly clumpy. Is this just the nature of the sweet brown rice, due to its stickiness, or something about the cooking process? I rinsed for 20 minutes. Overall really loved this recipe and will make again and again, just curious! 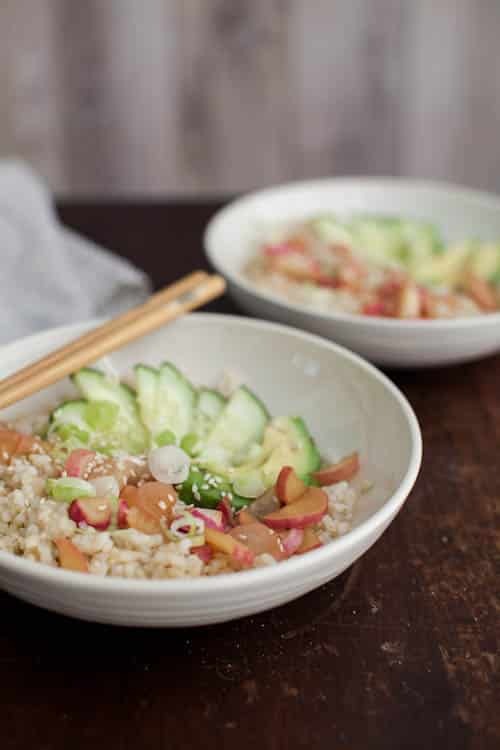 If you used the sweet brown rice, it does release more starchiness than traditional, long-grain rice. A few options: rinse after cooking to rinse off a bit of the starch, undercook the rice just slightly, or use short grain brown rice instead (still has a bit of starch but will be less likely to clump together.) Hope this helps! I made this for lunch today. It is seriously good. I added julienned carrot and some beet leaves to the pan while the radishes were cooking. I used avocado and cucumber as toppings. Thank you sharing this recipe.